Incisional Orchestrations: THE STATIC HYMNAL X6 C-60 BOX SET...OUT NOW. 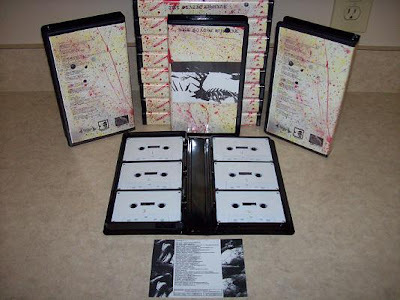 The Static Hymnal V/A 6X C-6O Box Set. We are beyond excited to bring you this project that has been 2 years in the making from 3 labels (Husk/Factotum/Hung Like a Horse) features 42 artists, on 6 c-60's. 6 cassettes of sonic depression and terror fueled electronics. Features some of the best Death Industrial, Drone, Experimental, Noise from around the world. Includes tracks from Wilt/Envenomist/Bernard Mothstal/Red Needled Sea/Jason Schuler/Teeth Collection/Altar of Flies/Family Battle Snake/Ordo Lacrina Christi/Pillars of Heaven/Kam Kassah/Altars/Sewer Goddess/Fat Legs/Josh Lay/Wether/Camisole/Natatraja/Gnarly Sheen/The Fortieth Day/Hallowed Butchery/Ettrick/Riververb/Blue Sabbath Black Cheer/Fermentae/One Lifeless Eye/Tree Creature/Stemcell Research Project/Ben Allen/Breath of Chaos/Steel Hook Prostheses/Scard/Dzakar/Hauntings/Demonologists/Toxicum Aestus/Scythe Death/M. Kourie/Black Moss/Metek/Ryan Unks/Gnaw Their Tongues. Full color artwork. Edition of 100 copies. $40 ppd in the U.S.
-you can order these from Matthew at Factotum(ex Epicene), myself at Husk, and very soon from Cory at Hung Like a Horse. Thanks.